~ A little journal of what I am into lately. So, I’m quasi-retired. I’ll admit it. I miss teaching. I asked the new art teacher (my amazingly positive and sweet replacement, Liz) if I could do a jewelry workshop for some of her kids. Needless to say, she snapped up the offer. So I went to “work” today, and prepped a small demo for 5 kids. And they were awesome! Keen, motivated and skilled. 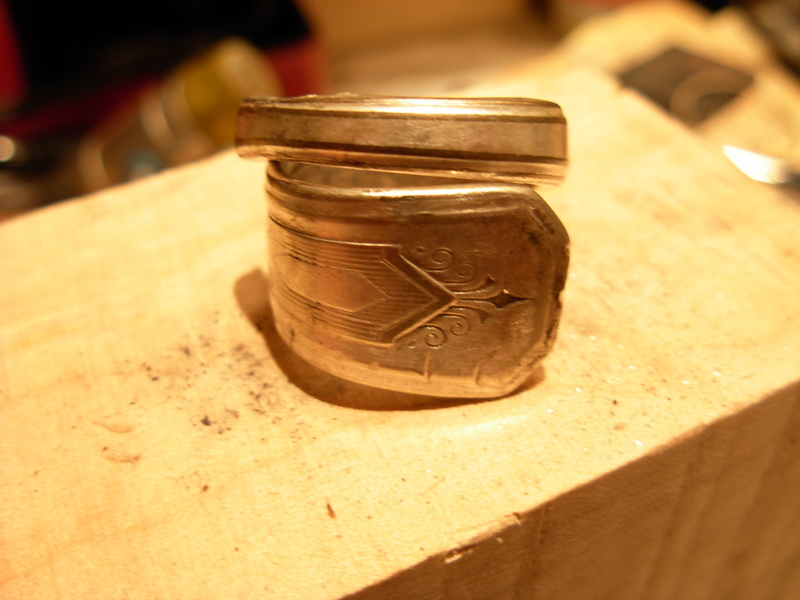 Here is a small step-by-step demo of making a ring from an old silver or silver-plated spoon. 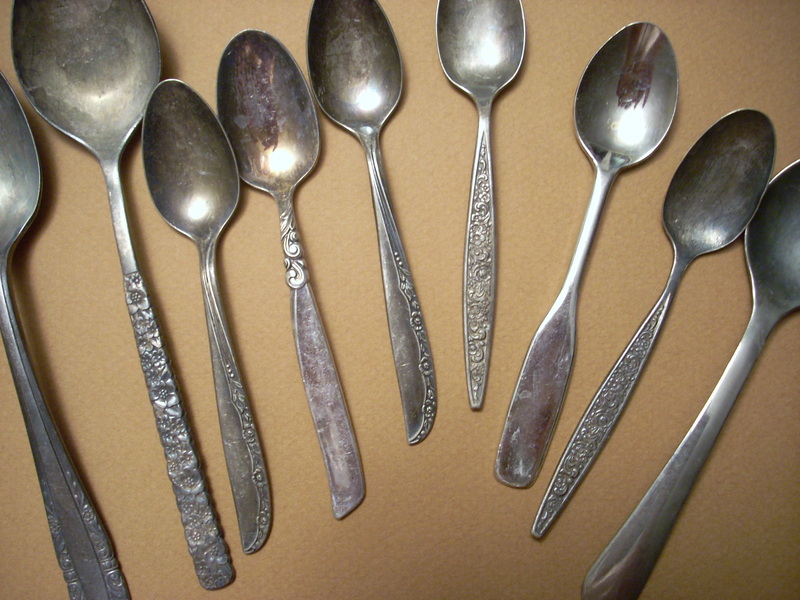 Pick a silver or silver-plated spoon that has an interesting handle design. Use a hacksaw or jeweler’s saw to cut the bowl off of the handle. Cut slowly-use light pressure. Save the bowl for another project. 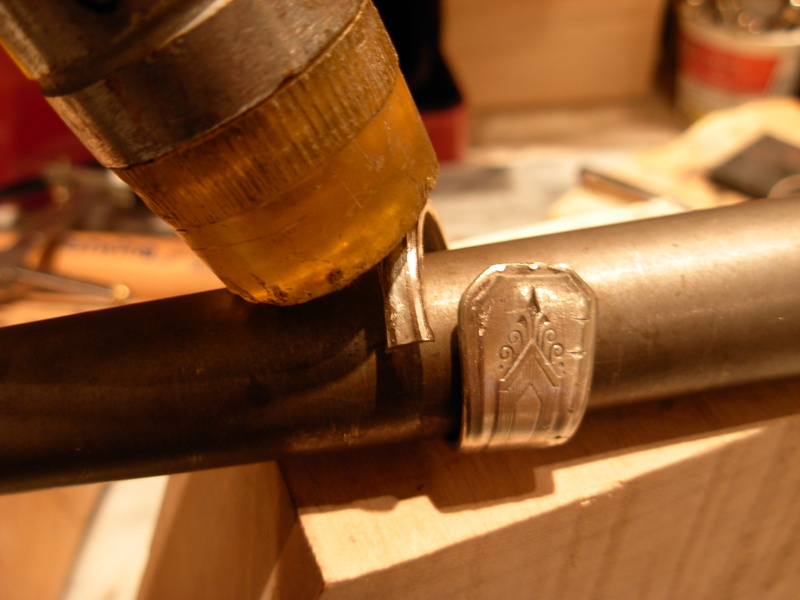 Using your finger, bend the handle around a mandrel or large metal rod. If the silver is too hard, it may need to be annealed (softened) by heating the metal with a propane (BQ) torch until the silver glows. If one cannot bend the ring with one’s fingers, use a rubber or leather mallet. If the narrow end of the ring is rough, it should be filed very smooth. Check to make sure the ring fits the finger. 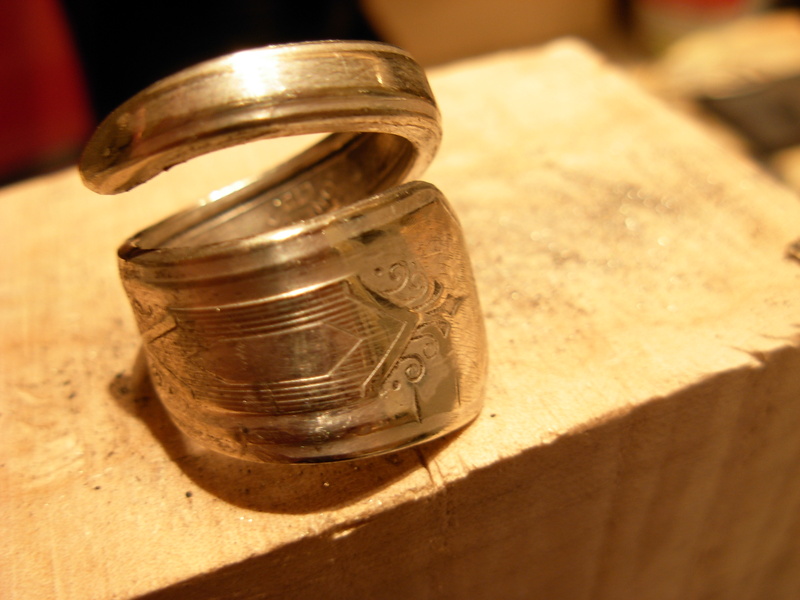 If the ring is snug, the ring can be pried open a bit to make a larger size. 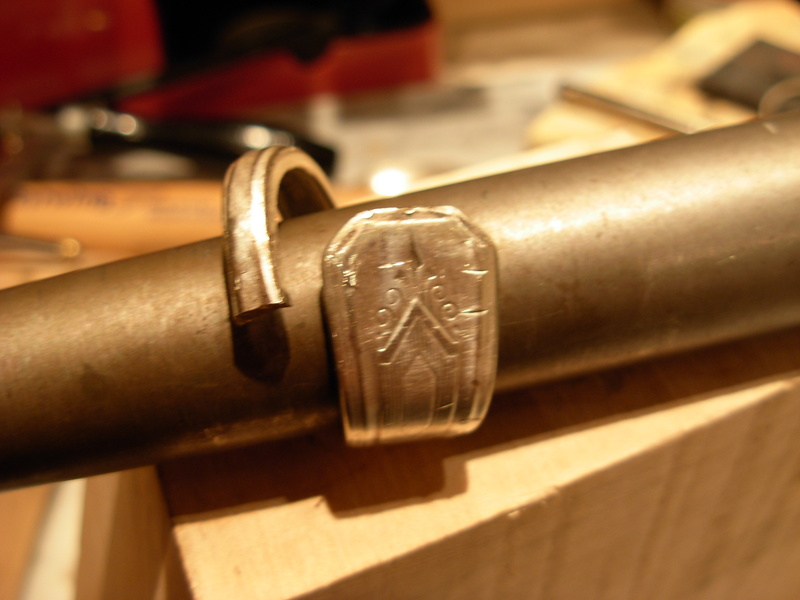 Polish the ring with a buffing cloth, silver polish, or a buffing wheel. It’s that easy. It’s a great class project for the 4-5 kids that have finished ahead of time. Value Village always has spoons-some are hard to bend and others are easier. Some are brittle. (I don’t know how to tell ahead of time which ones will work.) Sterling will always work. Easy and cool and fun! blog post or vice-versa? My site goes over a lot of the same subjects as yours and I feel we could greatly benefit from each other. Hmmm….your email didn’t seem to work. I run into trouble when it comes to the bending part. I’m not strong enough to simply bend it around the mandrel and it just keeps spinning around it when I try to use the mallet. If I heat it up, how do I hold onto it to work with it? Is there a special type of glove that won’t burn when I hold the red hot spoon? It’s too hard to hold onto the mandrel, spoon handle, and attempt to use pliers or tongs to hold onto it and use the mallet at the same time. Maybe there is a simpler solution and I just don’t have the right tools? Help! 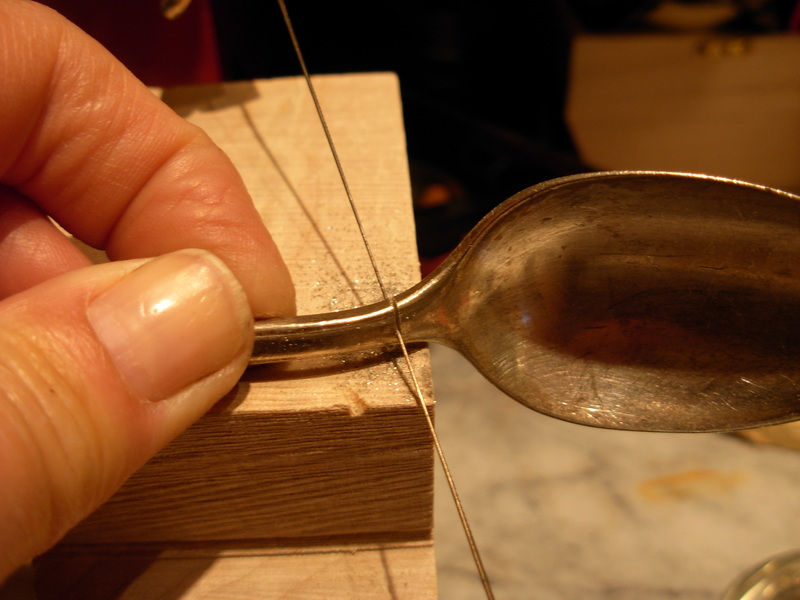 Every time you hit the spoon it hardens, so if it’s bouncing around on the mandrel it needs annealing(heating up). Next time you need to bend it as much as possible before hitting it. I usually sit on the floor to hold the mandrel or set it in a vice. If you heat the spoon, it can be held with an old pair of pliers secured in a vice. (I have heat resistant pliers.). It is then soft enough to bend. If it is just silver plated, you need to heat it in a small kiln, or the plating will melt. There is a tool called a ring bender that takes all those difficulties away, but it is expensive. You should try it. It works with forks, too. what works better – spoons or forks? Any silver handled utensil will work. If it isn’t real silver it may get too brittle and peel or break. It will likely be best if you flatten the bowl before you try to double it up. If you want the bowl as it is, then I’d heat and bend it at the thinnest point. Does that help? It will get very tough to bend into a ring after you bend it over on itself, I think. You may want to look up the perfect bending temperature(you may need to use a kiln) and keep reheating it, bend, reheat….etc. It’s called annealing. My son made the spoon ring for me using my mother’s silver-plated spoon (regular size spoon, not a serving spoon). He cut it off at the spoon end as described. Our trouble is that the spoon, in general, is too thick and feels uncomfortable on my finger. What do you suggest? 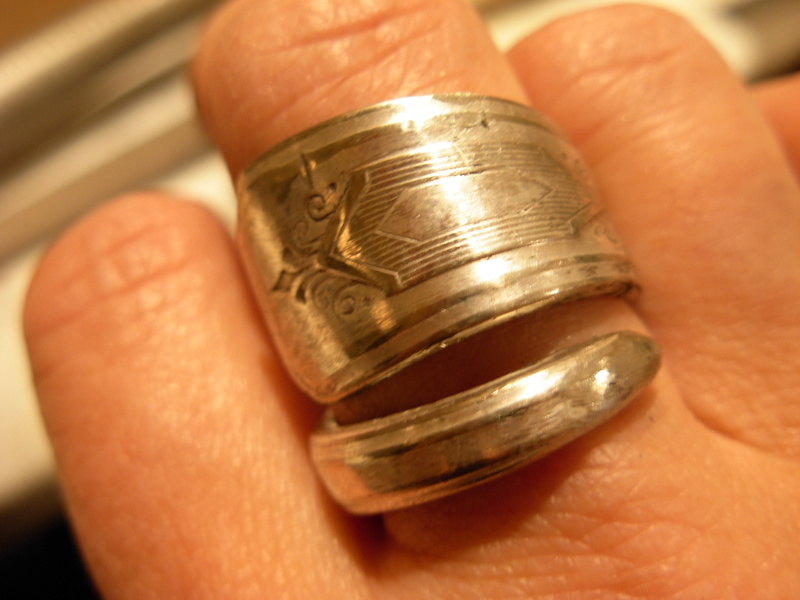 Oops….I meant that the ring is too thick and feels uncomfortable on my finger. That’s super sweet of your son. If it were silver, he can hammer it, roll it or file it thinner, but because it’s silver plate, I’m afraid that you’re out of luck. If he files it down, the metal beneath the plating would likely irritate your skin/ be discoloured. Sorry to disappoint you. He could try to file it and then wet sandpaper it, but I’m pretty sure the original metal won’t be that nice.